Tomorrow at the Town & Country Farmer’s Market we are pleased to welcome Chef Cullen Campbell from Crudo. He will be joining us from 9:00am to 12:00pm to provide his chef expertise and answer your questions on how to cook and prepare different vegetables and share some recipes from his kitchen. Chef Campbell and his restaurant Crudo have been receiving a number of accolades including the 2013 Chef of the Year by the Arizona Culinary Hall of Fame, Best New Restaurant from both the Phoenix New Times and Phoenix Magazine, and recently being included as one of only two Arizona restaurants in the “Top 100 Fit for Foodies” by OpenTable. If you haven’t been, Crudo is tucked behind the Gaslight Square Plaza off of 36th Street and Indian School. Chef Campbell’s menu is broken into four main offerings: Crudo (raw), Cotto (cooked), Mozza (cheese) and Griglia (grilled). He changes the menu regularly to reflect the seasons with a few favorites that stay throughout year, including the Squid Ink Risotto, the Butterfish, Short Ribs and the Buratta. Quite simply it all looks divine, and definitely worthy of all of the praise. Last night he kicked off a new series that will be hosted on the first Monday of every month at Crudo called the “Blank Space” dinner. The dinners are a collaborative event with a set menu that alternates dishes prepared by Chef Campbell and that of his guest chef. Chef Jeff Kraus of Crepe Bar was the first to partner on the event and the evening received numerous accolades. A new guest chef will be participating each month, and the list includes Phoenix culinary notables including one of our favorites Chef Kevin Binkley. You can buy tickets ahead of time, but don’t wait, because reservations are limited and fill quickly. We are thrilled to have Chef Campbell join us tomorrow at Town & Country and on Saturday, October 25th at our first Old Town Scottsdale Farmers Market of the season. 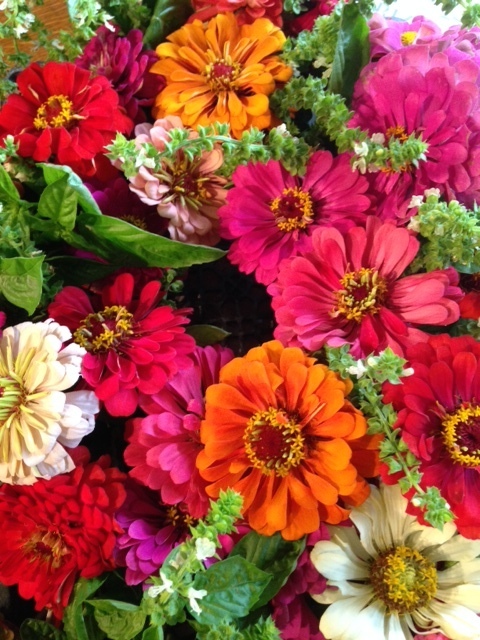 Tomorrow at the market we will have the first of the broccoli sprouts, three kinds of succulent pears (Bartlett, Red Starkrimson and Seckel), squash blossoms that are just about to end their season, and the above flowers that Marsha just picked from the garden. Please make sure to stop by and bring your questions to Chef Campbell and say hello. And even though the forecast is predicting rain, don’t forget that we are still in our indoor location on north side of Town & Country, so you can stay nice and dry while you shop.